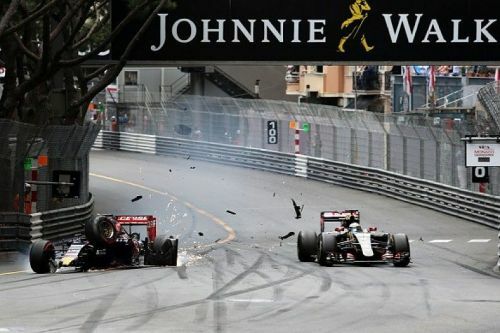 For the first time in F1 history, a virtual Safety car was used during 2015 Monaco GP, when Max Verstappen who was back then driving for Toro Rosso, rammed into the barriers after crashing at the back of Lotus driver Romain Grosjean. In the process of overtaking Grosjean by lap 59, the Dutchman ended up clipping on to the rear of Lotus at the Sainte Devote corner and then got carried away by G-force crashing the nose-first into barriers. Drivers played the blame game, the 17-year-old Verstappen felt Grosjean had applied brakes quite earlier than it was required which left him with no options as it was too late. While Grosjean complained that Verstappen wasn’t aware of the braking point and suggested that it is hard to overtake at Monaco. This crash earned Max Verstappen a five-place grid penalty for the following race in Canada GP. Stewards also felt it was Verstappen’s fault for the collision, also handed two penalty points on his license.